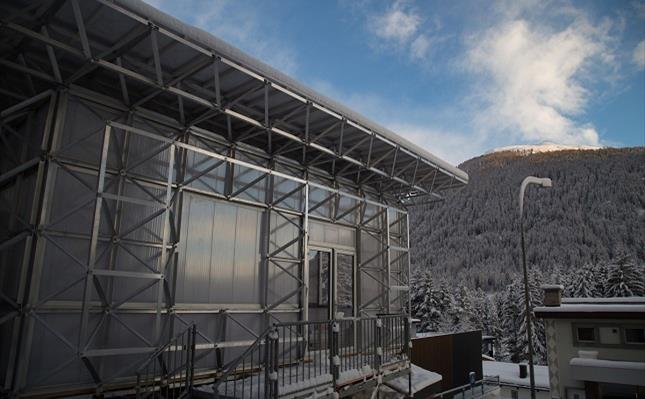 For the third consecutive year, SABIC is displaying a concept of an energy-efficient, quick to construct, and reusable building at the World Economic Forum (WEF) in Davos, Switzerland, from January 23 to 26, demonstrating the company’s commitment to invest heavily in innovative sustainability projects. ICEhouse™ was built using SABIC’s LEXAN™ sheet and systems for the walls, ceiling, roofing and windows. It promotes breakthrough technology and the architect William McDonough’s concept of the importance of closed-loop, durable carbon systems. William McDonough, sustainability pioneer, and his companies, William McDonough+Partners and WonderFrame LLC, designed and built ICEhouse with SABIC’s collaboration and support. ICEhouse™ represents a prototype for innovative building designs and structures that can be rapidly erected, and are useful in applications such as addressing the housing needs of people in extreme distressed situations. Complementing the ICEhouseTM at the WEF, SABIC will outline its work to underpin its continued commitment to help solve the issue of plastic waste. It is the company’s key ambition to decouple plastic from purely fossil-based feedstocks and drastically reduce the leakage of plastics into nature.